With Airwheel Smart self-balancing electric scooter, You Can Stand to Work. Abstract: Airwheel is a concisely designed self-balancing electric unicycle that enables you to commute to work with less effort and more fun. Airwheel is easy to learn and safe to ride. It's a perfect alternative to traditional transportation vehicles. Intrigued by the device that you often see people glide with along sidewalks? Does it feel like those people are floating on the ground? That device is called scooter electric which is becoming more and more popular around the world. Commuting to work with such a unicycle is becoming a new trend. There are many brands on the market. One of them is Airwheel which is concisely designed and quite suitable for beginners. There are now three types for customers to choose, namely X, Q, and S. The X-series is single-wheeled being the most agile type, the Q-series is designed with two adjacent wheels making riding more stable, and the S-series is equipped with a wide standing platform and a handlebar being the most stable one. The Airwheel electric self-balancing scooter is a personal transport vehicle that uses a gyroscope and attitude control stabilization to stay upright on its wheel without any other supports. With one foot either side of the wheel, you simply stand up straight and lean forward to move forward, lean back to slow down or go backwards and lean sideways to steer. Airwheel Q3 scooter electric is one of the most popular model. It has dual 14-inch wheels, an 800W motor and a 340W battery that's good for 24 miles of about-town scooting at a maximum speed of 12kph. This range is impressive and is quite enough for a short distance commute or you can use it to go to groceries or even roll it in warehouse and supermarket if you really don’t want to walk. You may think Airwheel is not safe because there's no handlebar and you may easily fall. 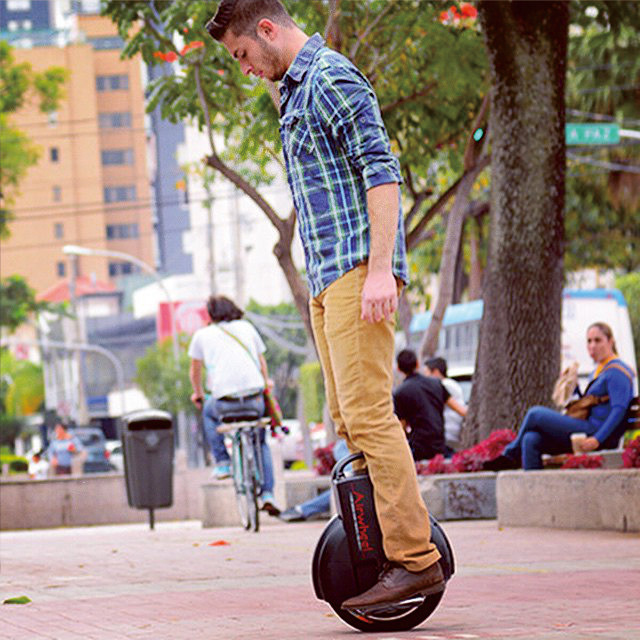 Actually, Airwheel is self-balancing with its inbuilt gyro. Riders can easily master the steering without costing much learning effort. Nevertheless, Airwheel is equipped with a really intelligent chip to guarantee rider's safety. To prevent the harm when riding too fast, Airwheel limits the maximim speed. When the speed is over 12Km/h, the front of the pedal will rise slowly. When the speed is approaching 16km/h, the front of the pedal will rise up. You will not be able to speed up by leaning the body. As soon as the speed drop off, the front of the pedal will reduce the angle of the lift. When Airwheel tilts to over 45 degree sideways, e.g. When Airwheel X8 turns over, the control system will activate tilting protection. The motor will stall immediately to prevent injuries. Airwheel is perfect alternative to traditional transportation vehicles. Now you can stand on Airwheel to work in style!